It’s been a long time coming, but Java 6 on OS X has hit the end of the road for updates. Mike Swingler has posted a message to the Apple java-dev list that confirms that no further Java SE 6 updates are available for any platform, including OS X. Java for OS X 2013-005 and Java for Mac OS X v10.6 Update 17 are the latest versions available and install Java SE 6 build 1.6.0_65. As part of this post, I’d like to say thanks to the Java folks at Apple for going above and beyond. Apple’s last Java 6 update was released in Oct 15, 2013, which was a full eight months after Oracle discontinued updates for other platforms. This allowed some vulnerabilities in Java 6 to be addressed that otherwise wouldn’t have been. Oracle’s Java 7 Update 51 has introduced new security requirements for browser plugins for applets and web start applications. However, not all applets are able to run using the new requirements. To help with this, Oracle has included a way to whitelist specific sites using Java 7’s new Exception Site List. This allows the applets and web start applications hosted on the specified sites to continue to work, even if they don’t meet the new security requirements in Java 7. On Mac OS X 10.7 and higher, the Exception Site List is a plaintext file named exception.sites, which is stored in /Users/username/Library/Application Support/Oracle/Java/Deployment/security. 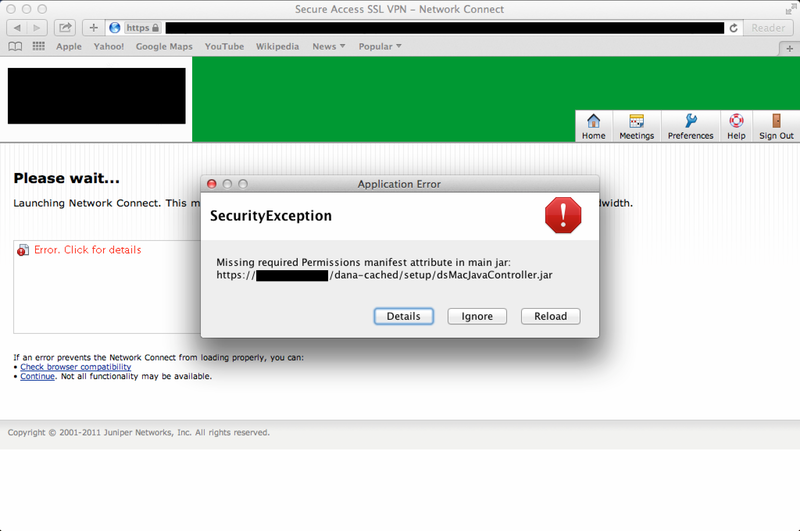 To help Mac admins manage the Exception Site List, I’ve written a script which is designed to add websites to Oracle’s Java 7’s Exception Site List without overwriting existing entries. For more details, see below the jump. One of my users was having a problem with meeting invites on his iPhone and iPad, where he would accept a meeting in Outlook 2011 and the meeting would show up afterwards as a new invite on his iDevices. He’d accept it there and it would be fine for a while, until he went to check something about the meeting in Outlook. At that point, his iDevices would again get a new meeting request for the already-accepted meeting that he had just looked at. After a lot of re-accepted meetings and frustration, a solution was finally found. See below the jump for details. The root cause is that Java 7 Update 51 now requires the existence of the referenced permissions attribute, along with a requirement to code sign all Java applets. The applets used by older versions of Juniper’s SSL VPN do not include the permissions attribute. The fix is to update the SSL VPN with Secure Access (SA) version 7.1R17, 7.3R9, 7.4R7, 8.0R1 and later versions. The applets included with these versions have the needed permissions attribute. Until the VPN server is upgraded, Juniper’s recommended workaround is use Java 7 Update 51’s Exception Site List feature. To help with this, I have a post showing how to add sites to the Exception Site List in the Java Control Panel settings. Oracle released Java 7 Update 51 on January 14th. 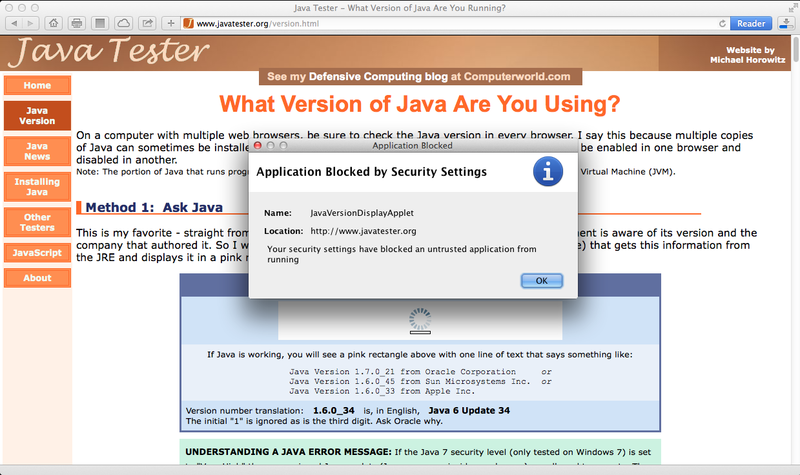 As part of the installation, the Java security level is set by default to High. With this security setting, self-signed and unsigned applets are blocked from running. This can be verified by going to http://javatester.org/version.html, as this site uses an unsigned Java applet. Fortunately, it appears that there are a couple of ways to fix this. See below the jump for details.